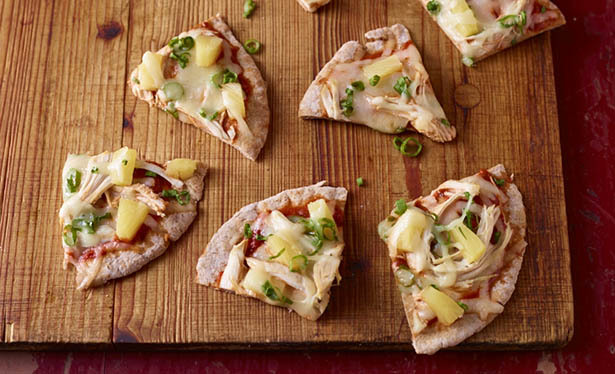 Use whole-wheat pita bread instead of the usual pizza crust and top with chicken, Monterey Jack cheese, pineapple, onions and parsley. You can use leftover chicken or rotisserie chicken from the deli. Split pita into 2 rounds by placing pita flat on work surface and carefully cutting around the edge. Separate the 2 rounds and place, cut side down, on a work surface. Spread each pita round with 1 tablespoon of pizza sauce. Top each pita with half of the cheese, chicken, pineapple and onion. Bake 8-10 minutes or until cheese is melted and edges are lightly browned.